Haralayyana Paduke means Haralayya's shoes. Haralayya was a tanner by profession who lived in Kalyana, a contemporary of Jagatjyoti Basaveshwara and King Bijjala. 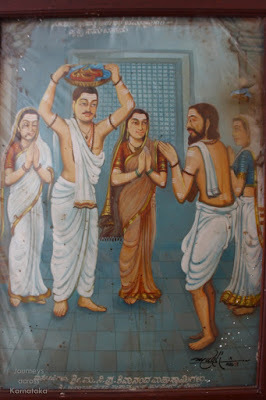 Haralayya and his wife Kalyanamma were part of the Sharana movement lead by Basavanna. During one of the Sharana gatherings it so happened that Haralayya greeted Basvanna formally saying “Sharanu” to which Basavanna responded by saying “Sharanu Sharanarthi”. Haralayya was awestruck by Basava's courteous greeting, who was a close aide of Kalyana's ruler King Bijjala. Haralayya felt that he had committed a grave sin because he had let a great soul like Basava had respected lowly person. To free himself of the sin Haralayya decided to make a pair of slippers from his won skin. Haralayya\s wife Kalyanamma said she had equal right in the deed and she too decided to give join the act. The couple cut off skin from their thighs, tanned and made pair of shoes befitting a minister. When the shoes were presented to Basava, he was awestruck, touched them to his eyes and placed them his head. 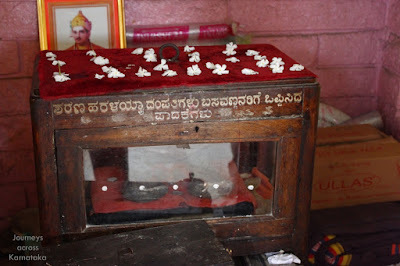 Basava said the shoes had divinity in them, he could never even think of wearing them and returned them to the couple. This story is from the XII Century CE. 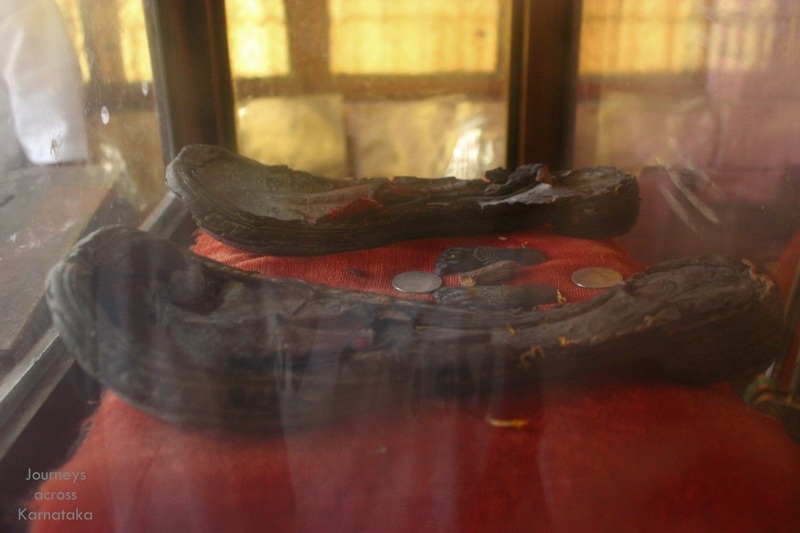 Nearly 800 years later the pair of slippers were rediscovered at Bijanahalli near Malked about 60 kms from Gulbarga. A small temple has been built for the divine pair of shoes. Few scientist have even tested samples from the shoes and confirmed they are made of human skin. Of all the ancient artefacts known, this is unique one indeed. I was curious to see those ancient shoes, my wait of 4 years came to an end on..
Our journey from Hyderabad to Bijapur started early morning. Our first stop was at Sedam to see few ancient Hindu temples and a Jain Basadi. 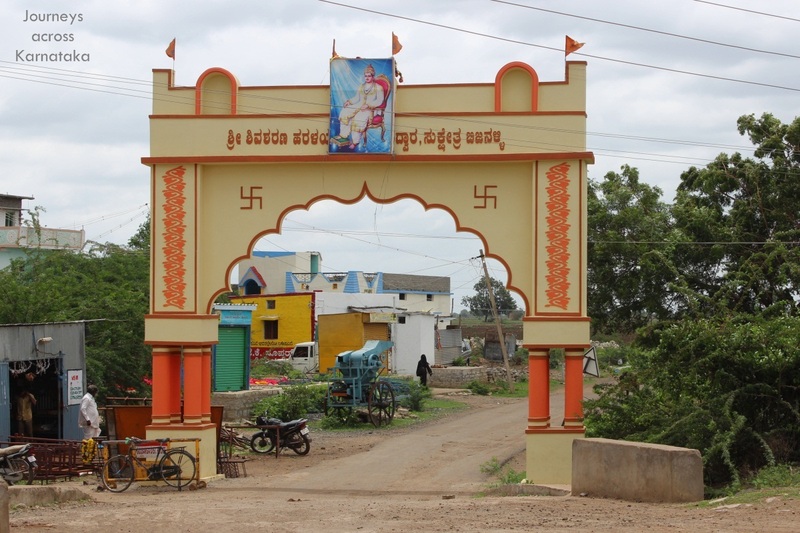 Next was Bijanahalli; as we approached Malkhed, on the highway, on the right was an arch of Bijjanahalli. Its one straight road from this arch to the abode of Haralayyana Paduke; no forks in between. We reached Bijjanahalli around 11 AM; villagers were helpful; two youngsters lead us to the temple, where two more joined. 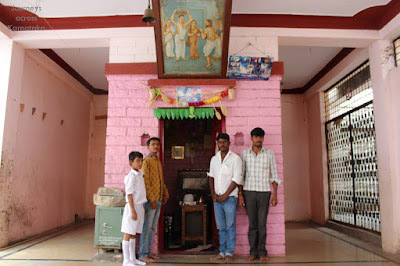 The boy in white school dress is Shivasharanappa - its his family who is in possession of Haralayya's shoes. This is an artistic depiction of the scene where Haralayya & Kalyanamma present their shoes to Basavanna. Having learnt that the shoes were made of their own skin, Basavanna places them on his head out of respect. Two ladies flanking Basava are his wives Neelambike and Gangambike. So this is the little shrine for this extraordinary pair of shoes. 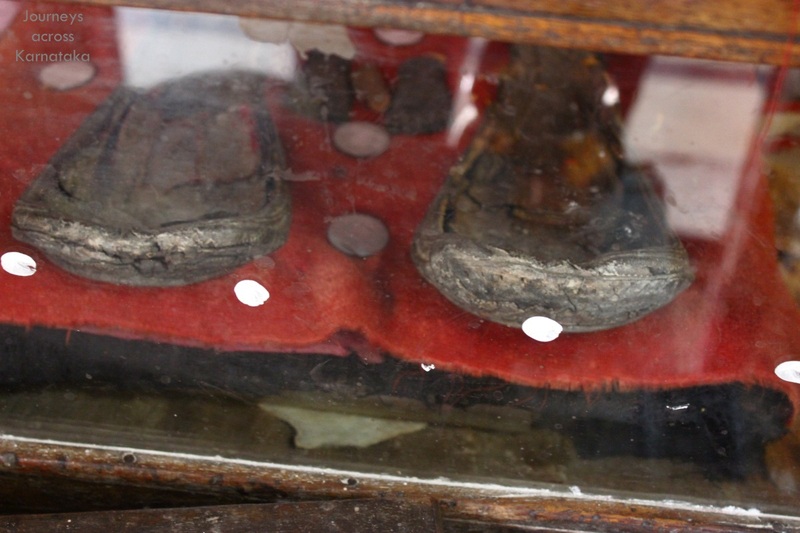 They are placed in a locked wood-glass case. 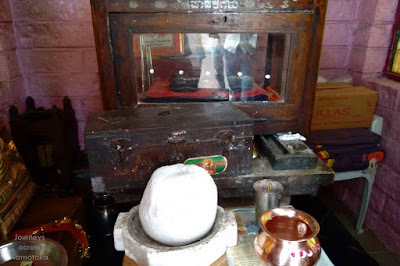 Rituals are performed everyday by Shivasharanappa's family. As seen from the front..
..and from the side. Watch this video of Haralayyana Paduke to see clearer pictures of the shoes. We thank our young friends for showing us the temple. We head back to Malkhed; we pass by its bus-stand which has an interesting theme.. modelled like a fort. Cheers to the architect who designed it and to the team who constructed it. We head to our next destination Nagavi near Chittapur. Historical sources say that India's second university existed at Nagavi. Had read about this in school days, but never knew it really existed. Awesome buddy !!! I still remember how i got terrified when i heard the story of Harallaya for the first time from my father as a bed time story when i was a kid, now too when i think of Harallaya making footwear, it brings chill to the bone, its very hard to imagine, its beyond the imagination the devotion, respect couple had for Basavanna, how they did it? I wasn't aware the footwear does exist, Thanks for the post.